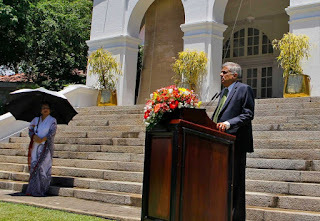 Officials from Prime Minister Ranil Wickremesinghe's United National Party were working to gain seven more seats to give it an outright majority and enable Wickremesinghe to be sworn in for a second term as prime minister, a position second to president in Sri Lanka. Wickremesinghe said he would discuss with President Maithripala Sirisena the concept of building "consensus on our national policies." "I have got a mandate to put our plan before Parliament, so that we could arrive at a consensus and build a national framework within which we will do our politics," he said. "Through this approach ... all parties could work together either in government holding a ministerial position or in Parliament through the oversight committees." On Wednesday, Rajapaksa accepted the results "with humility" and said he "will continue to engage in politics in keeping with the people's mandate and I will function within parliament to safeguard the nation and the democratic system." Meanwhile on Wednesday, foreign election monitors hailed the election. European Union monitors said the elections were "well-administered and offered voters a genuine choice from among a broad range of political alternatives, although campaign rules were restrictive." The Commonwealth observer group said the election was "credible, met the key criteria for democratic elections and the outcome reflected the will of the people of Sri Lanka."